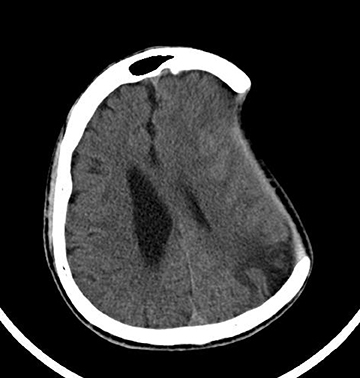 A 59-year-old male presented with spontaneous left-sided acute subdural hemorrhage, for which he underwent decompressive left craniectomy (Figure 1) with an uneventful recovery. He was discharged, but presented 4 months later with acute change in mental status. An unenhanced computed tomography (CT) brain study was performed for re-evaluation (Figure 2). 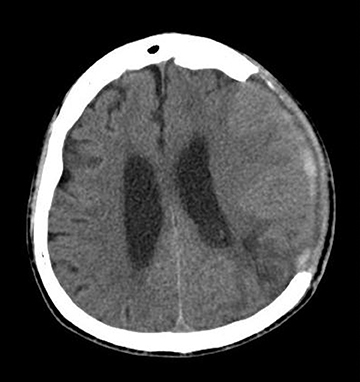 Figure 1 is a postoperative CT image at first presentation showing evidence of left craniectomy with a small amount of residual subdural fluid collection and blood. Figure 2 is a repeat CT image after 4 months. The image shows resolution of the subdural fluid collection and blood. However, there is interval demonstration of concave deformity of the left cerebral hemisphere together with the overlying skin flap, with associated distortion of the left ventricle and a new left subfalcine herniation. The pathophysiology of paradoxical herniation has been postulated to be secondary to a large craniectomy defect exposing the intracranial contents to the external positive atmospheric pressure. With a reduction in intracranial pressure postsurgery, the intracranial contents deviate under a pressure gradient away from the site of craniectomy. Therein lies the reason why CSF drainage procedures are uncommonly performed in patients post craniectomy, unless under exceptional circumstances. Common presenting features include a depressed level of consciousness, autonomic instability, signs of brainstem release, and focal neurological deficits. However, subtle neurological symptoms may sometimes be difficult to elicit in these patients due to pre-existing neurological deficits from prior insults. Therefore, a proper radiologic evaluation is crucial to establish the diagnosis. Imaging findings include a sunken skin flap with herniation of the brain away from the craniectomy defect, which results in subfalcine or transtentorial herniation.4. Our patient underwent emergency cranioplasty with subsequent uneventful recovery. Spontaneous paradoxical herniation is a rare complication postcraniectomy. Nevertheless, early recognition of this condition with emergent treatment is important to avoid a sinister outcome. Fields JD, Lansberg MG, Skirboll SL, et al. “Paradoxical” transtentorial herniation due to CSF drainage in the presence of a hemicraniectomy. Neurology. 2006;67:1513-1514. Vilela MD. Delayed paradoxical herniation after a decompressive craniectomy: Case report. Surgical Neurology. 2008;69:293-296. Sinclair AG, Scoffings DJ. Imaging of the post-operative cranium. Radiographics. 2010;30:461-482. Paradoxical herniation . Appl Radiol. Prepared by Dr. Chow and Dr. Poh while at the National University Hospital, Singapore.